How spider builds its web ? 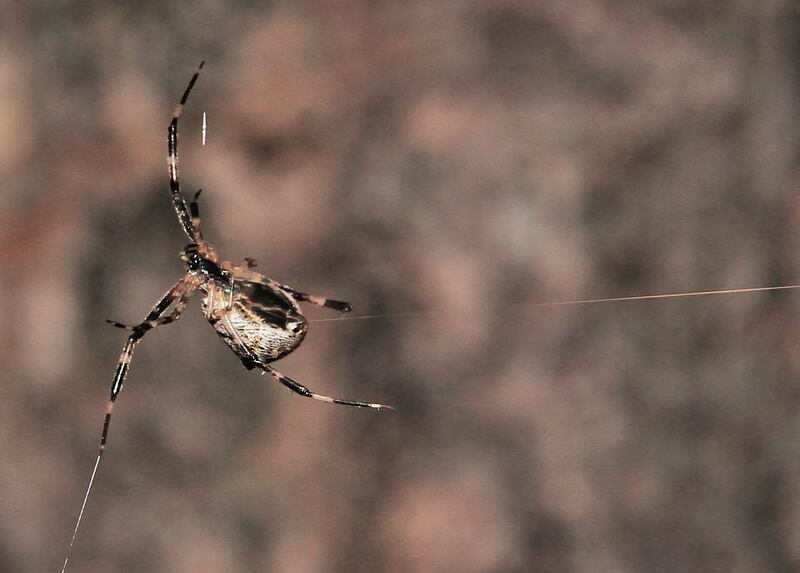 This page contains pictures and information about how Orb Web Spiders build their orb web. Before we look at how web is built, let's be familiar with the web structure first. The picture below shows the terms that used in the following paragraphs to explain how web is built. 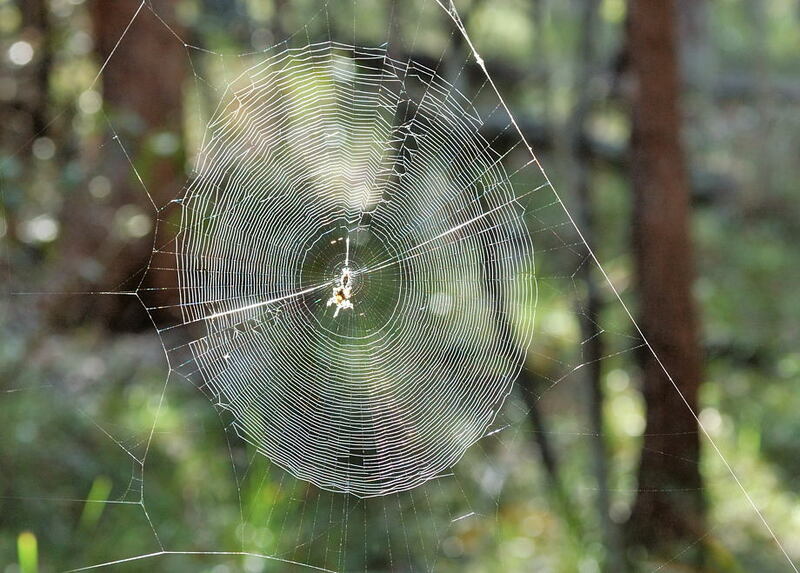 The spider web is made of different type of spider silk. 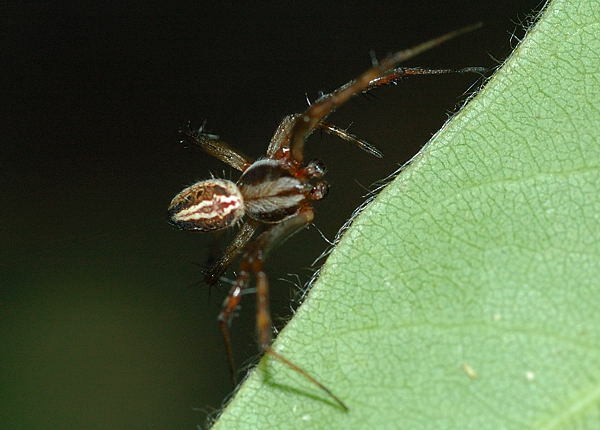 Spiders can generate different type of silk to build different parts of their webs. 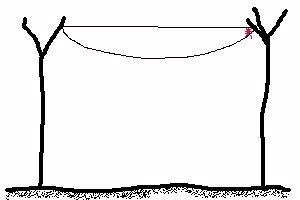 Bridge thread is constructed by very strong spider silk. Usually came back and forwards along the bridge thread, to lay more silk on it to make it stronger. Bridge thread support the weight of the whole web. 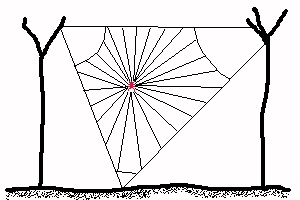 The spider carefully select the Anchor point and lay the anchor thread. Anchor thread is also constructed by strong silk, but usually it is only one single thread. Frame thread is attached on both sides on Anchor thread. 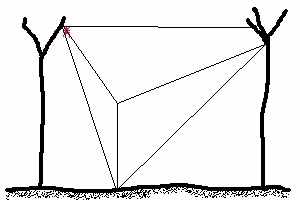 Together with the Anchor thread, they form the outside frame of the spider web. Frame thread is constructed by less strong silk, and is only one single thread. Radius is the silk connect from web central to the frame. The silk used to make the frames and radius are not sticky. They serve for supporting purpose. The spider will walk on those radius and not be entangled by its own silk. The auxiliary spiral is used as reference for laying the capture spiral, the sticky silk. Most spiders will remove the auxiliary spiral silk when laying the capture spiral silk.. Capture spiral is the only sticky silk on the spider web. It entangled prey if they enter the web. There are more information about spider silk in this page. Kiting - This is to let the wind to blow the silk, until the silk connect with something. There is a Garden Orb Web Spider living in our backyard since early this year. We called her Spicy. On 20 May 2000, we recorded in details how she build her web. On day time, Spicy hid herself between the leaves. She packed her legs together without any motion for the whole day. As normal, she left the bridge thread at her usual site. She has been building web at this location for over months. After sunset, when the sky is dark completely, Spicy came out to inspect her bridge thread. If it is still there, most likely she will build her web in the same location. If the bridge thread is missing, she has to make a bridge thread by kiting. This is to let the wind to blow the silk, until the silk connect with something. Today the bridge thread is still there so Spicy can start to build her web as normal. Spicy came back and forwards along the bridge thread, add more silk on it to make it stronger. Then she will start to set the centre of the web. Spicy will set serval anchor points. One anchor point is on the ground. The ground is a very dangerous place for spiders. There may be ants, lizards or other enemies. So Spicy will lay the ground anchor point very carefully. Then Spicy put some frame threads between those anchor points. This will be the outside frame of the web. After putting the frame threads, Spicy starts to lay the radius. The silk used to make the frames and radius are not sticky. They serve for supporting purpose. And Spicy will walk on those radius so she will not be entangled by her own silk. Spicy goes back and ford from the web centre and the frame to lay the radius. She checks every angle between radius. She checks all angles to make sure she does not miss any radii. Then Spicy put the auxiliary spiral silk, from centre spiral out to the frame. This auxiliary spiral silk she will use it as reference for laying the capture spiral, the sticky silk. The auxiliary spiral silk will be removed later. When Spicy reach the outer most frame, she returns and starts to lay capture spiral, the sticky silk. She spirals from outside towards the centre. She uses the auxiliary spiral silk as reference, and will remove it at the mean time. The web is finished when Spicy lay the stick silk close enough to the centre. Spicy used about two hours to build her web. Then she sits in the centre of the web, with each leg on each silk sensing if there is any prey get caught. We recorded how the Garden Spider captures prey on here. To see different Garden Spiders please click here. 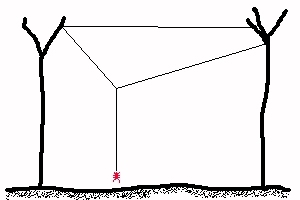 If you interested in how the Russian Tent Spider builds its tent web, please click here. There is also the net construction of Net-casting Spider in this page. How spiders learn to build webs? Scientists had shown that the web building skills of spiders is in-born, i.e., they do not learn from their parents. Scientists isolated a new born baby spider in a test tube and keep it away from other spiders. They feed them until the spider became an adult. Then they released it from the test tube. 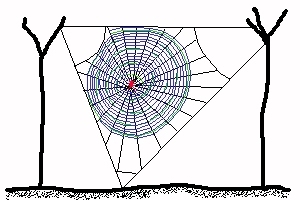 The spider started to build the webs, with some more practice on their own, it build webs as good as normal spider. 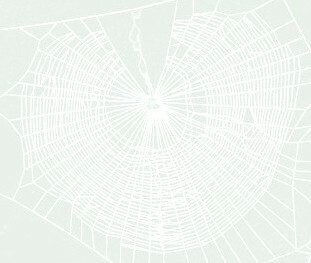 But then as the whole spider weaver group, how did they acquire the web building technique? This is a long evolution story. In short, with some guessing, the story are told as follow. Hundreds of millions years ago, the spiders did not build webs. No insects could fly yet. The spiders were just walking and jumping on the ground chasing for the insects. They did use silk but just to make egg-sacs to protect the egg they laid. One day, a spider was born with the behaviour that it would attach the silk to the floor when they walked or jumped. This behaviour had some advantages. It was easier for the spider to go back where it was by follow the silk they laid to return. More important was when it jump to catch the prey, if it missed, it could climb and return back where it was by holding the silk. If not the silk, it would be a long way to go back. Because this was a good behaviour, this characteristic was inherited by its off-springs. Then a group of spiders walking with a silk attached behind became a new species. After a few million years, more and more different kinds of insects were flying in the sky, and very hard to catch. One of the spiders in this group evolved another useful behaviour. When it jumped backwards and forwards, chasing the flying prey between branches, with the silk attached from its back, it accidentally built a very messy web, or we could not even call it a web. However, this messy thing did entangle some prey sometimes. So the spider, besides chasing the prey, it could also go back to its messy web to look for some prey. Of course this behaviour was also passed to its off-spring. Then another few millions of years, the spiders evolved some better ways to build the messy web, and they relied more on their webs to catch the prey. The web building skills were improved and diversified. Today we have many different spiders with different web building techniques. 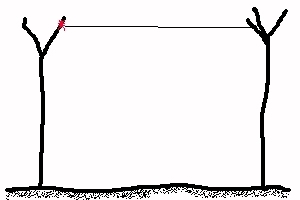 What are the advantages for the spiders to leave the bridge thread on site? The Garden Orb Web Spiders are nocturnal spiders. They build webs after sunset, eat their webs and hide into their retreat during the day. Usually they will leave the top silk, the bridge thread on their site. We observed that there are at least three advantages for the spiders to leave the bridge thread on site. The first advantage is used as a mark for territory. 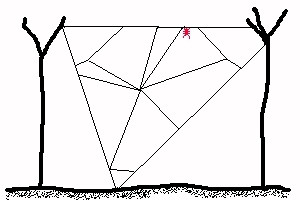 The remaining bridge thread can tell other spiders that the site is occupied. The bridge thread may also lead the male spider to find the female spider. A good sit for building a web is not easy to find. A good site should at least be able to supply enough prey, near the retreat and free from disturbance. Once the spider finds a good site, it is sure that it would like to keep it. By leaving the bridge thread they can build the web at the same location the next evening. Without the old bridge thread, spiders will establish the bridge thread by kiting. This is to let the wind blow the silk to another branch. This way does not guarantee the spider will find the site as good. Another import advantage is if the remaining bridge thread is broken, this indicates that the site has been disturbed by large animals. It may be a dangerous place to build the web. The spider could be better off looking for somewhere else. Why doesn't the spider leave the whole web? If the spider simply leaves the whole web and hide during the day. It will also have all the above advantages. Why doesn't the spider just leave the whole web? Actually, the Garden Orb Web Spider does sometimes leave the old web and reuse it the next evening. But most of the time it will only leave the bridge thread. There are at least three reasons. First, the web silk is make of protein, and is an important source of survival. It is better to lose a bridge thread of protein than the whole web. Secondly, in the day time, the remaining web may kill the prey without benefit the spider. It could be a waste to the spider. Third, the web in day time may show the spider's predators, such as the wasp, where to find the spider. Last updated: October 28, 2009.